PLANTATION, FL--(Marketwired - Mar 19, 2014) - According to Healthcare.gov, the Health and Human Services arm that is in charge of the federal health exchange, more than 400,000 applications for stand-alone dental plan coverage were received through the public exchange1. While some Americans are signing up, according to the National Association of Dental Plans, 126.7 million Americans are still without dental coverage nationwide -- that's more than one-third of the 313 million people who reside in the United States. Everyone needs an affordable medical plan in order to maintain good health and be prepared for emergencies, and now having one is required by law. The goal of the Affordable Care Act (ACA) is to offer individuals, families, seniors, and employers/groups access to affordable health plans to help them maintain good health and be covered when needed. While some of the ACA health plans include dental coverage, many do not. This leaves many Americans confused as to whether their or their family's teeth are covered under the ACA. As the Affordable Care Act (ACA) enrollment period comes to a close on March 31, 2014, many Americans are wondering what options they have for dental coverage. Dental care is critical to a person's overall health. Adult dental issues are linked to heart disease, stroke, diabetes, pneumonia, poor pregnancy outcomes, and dementia. And tooth decay is the number one childhood illness, causing malnourishment, infections, and surgery leading to problems eating, speaking, and learning, according to the National Children's Oral Health Foundation. Under the ACA, pediatric dental care is defined as one of the 10 Essential Health Benefits (EHB) for children (up to 19 years old). The ACA marketplaces are required to offer pediatric dental plans, but they may be separate from the medical plan and sold as stand-alone policies. It is these stand-alone policies that worry experts and deter consumers from the exchanges. Families who opt not to buy stand-alone dental coverage for their children won't be penalized. And if they do purchase a stand-alone dental plan, it won't be eligible for a federal subsidy, even if they are eligible for help in buying their overall health plan. The ACA also does not require adults to be covered for dental services in medical plans. Therefore, adult dental benefits have to be purchased separately, because they are optional under the law. Stand-alone dental plans may be available through the federal health exchange, healthcare.gov, but only with the purchase of medical insurance plans. For example, if you have health insurance through your employer, but not dental insurance, you won't be able to buy just dental coverage on healthcare.gov. And for Baby Boomers who are retiring and will lose employer sponsored insurance, they now will need to pay out-of-pocket for dental care or obtain alternative coverage such as through a Medicare Advantage plan. According to a recent study prepared for the American Dental Association, two-thirds (66 percent) of adults 65 and over have no dental coverage. So where does that leave Americans' teeth? The ACA really falls short in covering this gap for most of them when it comes to their dental care. As an alternative, dental savings plans are becoming a more popular choice for Americans. According to the National Association of Dental Plans (NADP), sweeping changes in dental coverage will result in approximately 30 to 40 million people entering the dental benefits market and another 10 to 20 million people will either lose or change their current benefits plan. "Quality dental care should be accessible and affordable to everyone," says Jennifer Stoll, president of DentalPlans.com. "Oral and vision care are an essential part of a person's overall health and well-being and lack of coverage can really impact your quality of life." 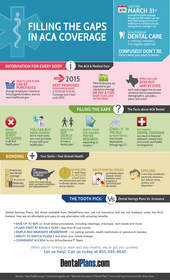 Visit http://www.pinterest.com/pin/233694668138521490/, to learn more about the connection between your oral health and overall health, as well as important ACA facts and deadlines. Dental savings plans provide programs that help individuals, families, and groups save on their dental care and other health-related services, with one low annual fee. Similar to a warehouse club, consumers pay an annual fee and get access to significantly reduced rates on dental services, cosmetic dentistry and orthodontia, as well as vision and prescriptions, depending on the plan they choose. Services may include annual cleanings, x-rays, crowns, root canals, and even cosmetic and orthodontic procedures, which are not typically covered by insurance. Using the Careington Care 500 Series plan, which costs a low annual fee of $189.95, a family of four could save $626 just on their annual ADA recommended treatments alone. That's $436 in savings, when including the cost of the plan. And the savings can really add up when considering additional dental care that may be needed for you and your family, like sealants for children's teeth, crowns, braces, and more. DentalPlans.com has been providing dental savings plans since 1999. The company offers an extensive selection of comprehensive dental savings plans from the nation's most trusted networks, like Aetna and Careington, and more than 140,000 dentists to choose from nationwide. Participating dental specialists include orthodontists, oral surgeons, periodontists, endodontists, pediatric dentists, and general dentists. DentalPlans.com also offers savings plans for vision, hearing, chiropractic, and pharmaceutical services. DentalPlans.com has successfully been operating as a private exchange since 1999, as the leading retailer of dental savings plans. Similar to a membership at a warehouse club, consumers pay an annual fee and get access to reduced rates on dental services and cosmetic dentistry and orthodontia, as well as vision and pharmacy. Members can choose from more than 30 different plans from trusted healthcare brands, like Aetna, Careington, Signature Wellness, and UNI-CARE, and have access to more than 140,000 dentists in combined networks nationwide. DentalPlans.com has affordable plans to fit any need and budget. And, depending on the plan you choose, consumers save 10 to 60 percent off services. Visitors of DentalPlans.com can compare plans by ZIP code or procedure, view sample savings and find a nearby dentist. DentalPlans.com is committed to making you smile, by making access to quality oral healthcare affordable and available to everyone nationwide. It's one of the reasons the company has been on the Inc. 5000 list, 3 years standing. To connect with DentalPlans.com visit us at www.dentalplans.com or on Facebook at www.facebook.com/dentalplans. *Regular cost is based on the national average of the 80th percentile usual and customary rates as detailed in the 2013 FairHealth Report in the Los Angeles, Orlando, Chicago and New York City metropolitan statistical areas. *These fees represent the average of the assigned Careington Care 500 Series fees in the Los Angeles, Orlando, Chicago and New York City metropolitan statistical areas. Filling the gaps in ACA coverage, by DentalPlans.com.